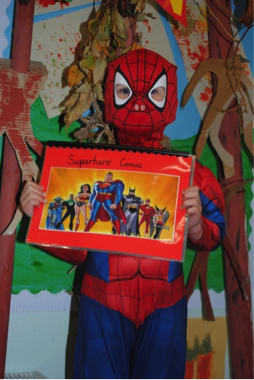 Whitesheet are always encouraging the children to think of imaginative topics so this term the younger children came up with ‘superheroes’. This was great for learning and the children had a wonderful role play area and have created a Superhero comic book. The culmination was the last day of term when all the staff and children arrived dressed up as their favourite superheroes. Everyone in our academy is also a superhero because, even though it is a very small academy with just forty four children, they managed to raise £195 as part of the MacMillan World’s Biggest Coffee Morning. The Coffee Morning was preceded by a Food Technology week at the academy and all the children enjoyed baking cakes for sale at the Coffee Morning. The parents also spent time baking and donating cakes for sale. Everyone was amazed at the number and range of cakes that were brought in to school. The school hall was packed with families and friends. Not only did they enjoy eating the excellent cakes and drinking good coffee but they were entertained by the school choir led by Florence (a year 5 pupil) who accompanied them on the piano.